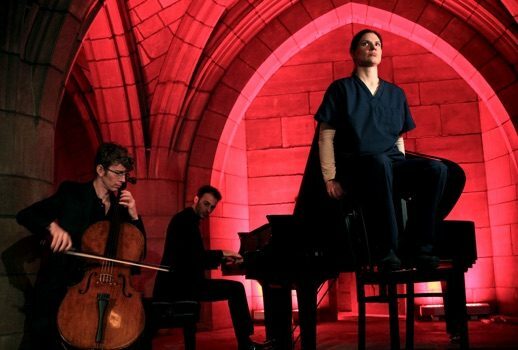 The Crypt Sessions, in collaboration with On Site Opera, presented the world premiere of Gregg Kallor’s The Tell-Tale Heart Wednesday night in Hamilton Heights. The program, consisting of the short monodrama and two additional instrumental pieces (also by Kallor), moved nimbly from a sincere, emotional urgency, toward an effective climax of macabre hysteria. Part of the draw of The Crypt Sessions is its unique venue. Performances happen in the Crypt Chapel, a small and gothic room located beneath the Church of the Intercession. The space is appropriate for both romantic and melancholic affects; and while the chapel was, indeed, an inspired setting for The Tell-Tale Heart—the vaulted, cloistered qualities well suited for a meditation on entombment—it also served Kallor’s instrumental music as well. The evening began with these pieces, featuring Kallor on the piano and Joshua Roman on the cello. The first was titled “Where You Are,” for solo piano. It was sensitive and sincere, with a jazzy, crossover element that I found appealing. The second, “Undercurrent,” scored for piano and cello, explored notions of connection and miscommunication; the two instruments examined this theme through passages of conjunction and divergence. And while I found the second piece more rigorous than the first, both “Where You Are” and “Undercurrent” displayed a palatable musical aesthetic. The centerpiece of the evening was certainly The Tell-Tale Heart, a semi-staged performance featuring the admirably game Elizabeth Pojanowski. For those unfamiliar with Poe’s story, The Tell-Tale Heart is the ghastly account of a murder and confession, and it examines the complicated (to put it mildly) relationship between the narrator/murderer, and the old man she victimizes. In the story, the narrator has a monomaniacal obsession with the old man’s “vulture eye,” a watery blue iris, covered with what seems to be a cataract. And it is this eye that ultimately provokes violence from the narrator, urging her to brutally murder the old man in his bed. Kallor’s music made good use of Poe’s compressed structure, with a score that moved briskly through a complex psychological evolution. Scored for piano, cello, and mezzo-soprano, the beating of the titular heart was enacted through a leitmotif that sounded slightly similar to the theme of Jaws. Even so, Kallor’s score managed a satisfying reading of a disturbing subjectivity. Moreover, Kallor’s setting for mezzo-soprano was an interesting choice. In many interpretations and adaptations, Poe’s narrator is traditionally assumed to be a man; perhaps this is because of the violence attributed to the character, as well as the physical strength necessary to commit the crime. And so, the choice to set the score on a woman’s voice was an intriguing notion to consider, one that brought to the surface provocative questions regarding gender, crime, and madness. That being said, Pojanowski was a committed murderess. Her costume consisted of a simple set of scrubs, which suggested that her character served as the old man’s nurse. Her face and body moved in and out of shadow, as if she told her tale beneath the glare of an interrogation lamp. There was a wonderfully cinematic quality to this imagery. Also, her voice was flexible and athletic enough to handle Kallor’s difficult writing. But while I admired her willingness to communicate lunacy through a robust physicality, there was still something too exterior about her acting. She seemed to enact insanity, but not quite embody it. The staging by director Sarah Meyers was simple and clear, relying solely on a chair as the only gesture toward a set. Pojanowski made effective use of this chair, scrambling up it like a monkey, darting around it, and even, at one point, flinging it down on the floor fiercely. While the Crypt Chapel is a bit cramped, both director and performer made wise use of this performance space. Special mention should also be made of the lighting design by Shawn Kaufman, which included the clever deployment of a manipulated spotlight to highlight the narrator’s creepy obsession with the old man’s eye. After The Tell-Tale Heart ended, Kallor and Roman concluded the evening with an encore of Arvo Pärt’s emotionally charged “Spiegel im Spiegel,” which functioned like a sweet balm for the violent, psychological pain that preceded it. And while this, at first, seemed at odds with the subject matter of murder and entombment that constituted much of the evening, Pärt’s minimalist approach offered an alternative vision of death and rest. And this, most definitely, was a more comfortable way to end an evening in a crypt.